As the PP Blog reported Oct. 19, federal prosecutors have opened a criminal probe involving Obopay and Payza and successfully asked a federal judge to pause civil litigation involving both payment-processing companies. The Blog is reporting today that federal prosecutors in the Northern District of California and the District of Columbia specifically intervened in a lawsuit filed by Payza against Obopay and others on March 25, 2015. Payza’s lawsuit alleged Obopay had engaged in a multimillion-dollar fraud during business dealings. Prosecutors asked a judge to halt the case on June 23, advising her that a criminal investigation was under way. The targets of the probe are unclear. It could be one or more parties involved in the litigation between Payza and Obopay. On July 20, U.S. District Judge Phyllis J. Hamilton, presiding in Oakland, granted the intervention and ordered the case stayed until Jan. 22, 2016, according to docket entries. 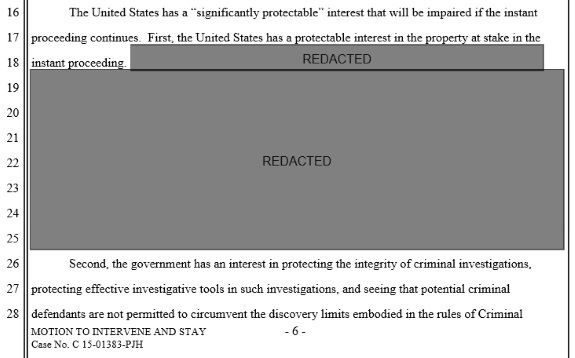 The public portion of prosecutors’ filing is heavily redacted, leaving the targets of the criminal probe unclear. In the United States, the Fifth Amendment is a Constitutional protection against self-incrimination. Obopay and Payza have been clashing since at least November 2013. Federal prosecutors in the District of Columbia confirmed earlier this month that Homeland Security Investigations is conducting the criminal probe.